The show will mark the first time that Monty Python has performed together since 1998, when they appeared at the Aspen Comedy Festival (although they have made some appearances together, most notably at the 2005 opening of their musical, Monty Python’s Spamalot). The troupe’s sixth member, Graham Chapman, passed away in 1989. Rumors about the reunion began swirling when members of the press received invitations to Thursday’s press conference, followed by Idle tweeting about the event to his followers. Cleese was also quoted as stating that “Monty Python is set to be a flying circus all over again,” which seemed to confirm fans suspicions that the troupe would be getting back together. No details about the stage show have been revealed, including whether or not it will be a one-time event or a tour. It is also not clear whether the group will perform any new material or simply stick to their classic sketches, like they did with their performances at the Hollywood Bowl. It will be interesting to see if the group incorporates any of the musical numbers from Spamalot, which despite being based on Monty Python and the Holy Grail was only worked on by Idle. Due to its source material and Idle’s involvement, it’s just as likely to be part of the performance as any of the other Python projects, although it seems to be less popular and holds less significance for fans than the films and sketches do. Regardless, there is sure to be a performance of “Always Look on the Bright Side of Life,” which Idle performed at the 2012 Olympics Closing Ceremony, as well as other classics like “The Lumberjack Song,” “The Ministry of Silly Walks,” “The Dead Parrot Sketch,” and “The Spanish Inquisition.” Fans have also speculated that the show could be a lead-up to a potential film or television show (which would probably make Jones enough money to pay off that mortgage), but seems to be an unlikely conclusion. 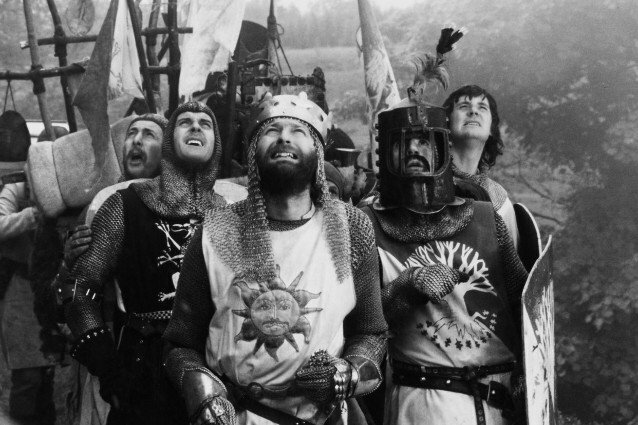 The press conference formally announcing the Monty Python reunion will take place on Thursday, November 21. According to Idle, it will be televised live from The Playhouse Theater in London, where Spamalot is currently running. Fans outside of the UK will also be able to watch the announcement live as Idle has promised to tweet out a link to a live stream for all of the Python fans in other countries. Until then, you can watch the most recent Monty Python reunion, the 30th anniversary of their final film, Monty Python and the Meaning of Life, below.